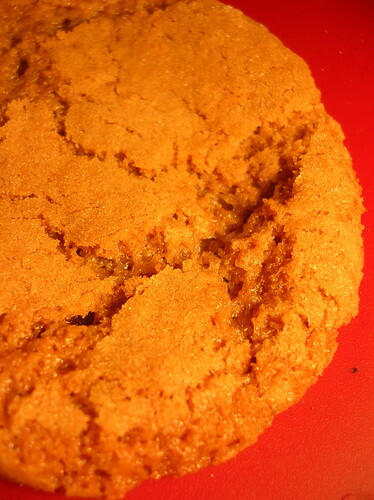 ginger-molasses cookie, originally uploaded by shaunaforce. When it comes to cooking great, gluten-free food, I have all the enthusiasm in the world. In the past year, I’ve found this avid passion for food, health, and living life well. Every day, I troll websites for more accurate information on what I can eat, where I can go, and how I can be even more alive. The table in my front foyer—an old butcher’s block that once rested in my kitchen, before I bought my gleaming kitchen shelves—is strewn with dozens of cooking magazines and medical books. I keep adding to the pile. Since I found out I can no longer eat gluten, life has shone more brightly. I’ve never cooked so much good food in my life. But I have so much left to learn. When it comes to food, I have dozens of discoveries dotting my kitchen. Smoked paprika. Herbed sea salt. Chocolate chestnut spread. Copper bowls. Le Creuset casserole dishes. The memory of homemade chicken stock and roasted garlic and millet fritters surround me when I stand in front of the stove. When I think of the foods I didn’t know existed this time last year, I actually grow giddy at the thought of everything else that awaits me. But there have been disasters and near-misses as well. I’ve only shared the loveliest stories here, of course. Oh, there was the custard in September. But I haven’t shown you pictures of the wilted salads, the soups that turned out just okay, the meat cooked too well to taste it anymore. There have been plenty of mistakes in my kitchen. That’s how I learn. (I’m pretty sure it’s how we all learn, actually.) But I have so much left to learn. There’s a (perhaps apocryphal) story my father told me repeatedly, growing up. According to him, the last words of Leonardo da Vinci were, “What a pity it is that I have no more time left to learn.” (Now, when I look online, I find many sources citing his last words as, “I have offended God and mankind because my work did not reach the quality it should have." Gad, I hope not. That’s such a sad, perfectionist way to go out. I think I prefer my pop’s story.) Of course, my father is a teacher, along with my mother, so my brother and I were inculcated with this philosophy early. And I’m glad. I make a plethora of mistakes, every day, but the inexhaustible urge to learn, more and more, fuels me, daily. And this holiday season, I’ve been feeling the urge to learn how to bake holiday cookies. Gluten-free holiday cookies, that is. I don’t want to brag, but I used to be great at baking. Every December, I turned out thick sugar cookies, iced in rich buttercream frosting, in quaint shapes of Christmas. Eventually, I could turn out a batch of exquisite cookies in half an hour flat. There’d be flour in my hair, bits of dough on the floor, but at the holiday parties, everyone oohed and ahhed. And the plate piled high with cookies quickly emptied to just the green sprinkles. One of my friends still talks about the single batch of ginger-molasses cookies I gave her as a present, four years ago. When she was working in Afghanistan, she emailed me to say that those cookies were one of the experiences she most missed about this country. But now, with all these new flours, and mixtures, I have had to start over again. And sometimes, I have fallen flat. I feel good about my pie crust. I’m okay with my banana bread (still too much soda, though). But the cookies? They’ve been elusive. When the last batch came out of the oven, spread flubby over the tray like some of those strange creatures from Dali’s Persistence of Memory, I wanted to cry for a moment. And then I reminded myself, “That’s all right. You’re still learning.” And I hope I always will be. Still, there’s no need to go all this alone. 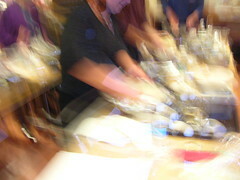 Last month, I was thrilled to see a gluten-free cooking class on the Salud! schedule at my local Whole Foods. And when I realized the class focused on holiday cookies in particular, I paid the nominal fee immediately. And in the midst of a ridiculously busy week at school, I took sanctuary in the thought of the impending cooking class. So last night, I walked into Whole Foods after a long day of school, eager to listen and learn. It turns out this was a hands-on class, instead of a long lecture. And an eating class. Michael, the head of the cooking program there and an inexhaustible fount of information, passed around my favorite carraway crackers, with artichoke dip from the deli. Hummus. Red pepper dip. All verified gluten-free, of course. He even came around with glasses of Spanish sparkling wine. And before each of us lay trays with eggs, little paper cups of lemon zest and baking soda, and metal containers filled with gluten-free flours. I felt at home. Our teacher was a lovely young woman named Sonya Joseph, who has been gluten-free for the past two years. Her story sounded familiar to everyone in the room: a childhood and young adulthood riddled with medical problems, inexplicable complaints, and multiple bouts of pneumonia. (This intrigued me, particularly, as I’ve had pneumonia six times in my life, with no clear reason why. Until I was diagnosed with celiac.) After another year of utter exhaustion and lousy health, she sought out a nutritionist, who tested her and told her to cut out gluten and dairy. Ever since, she has been healthy. And it turns out that her husband had celiac, and he didn’t even know it. So they both live gluten-free. And she has turned this trauma into an unexpectedly joyful way of life. For the cookies, we used Featherlight Flour, a gluten-free mix based on Bette Hagman’s books. It worked beautifully. Why have I been buying pre-made, gluten-free flour mixes, resisting making my own? Well, before I was diagnosed with celiac, I would never have insisted that I make my own flour. It’s more convenient to stop in PCC to pick up another little bag. But the longer I’m at this, the more I realize I have to find a store full of bulk bags of rice flour, tapioca starch, and cornstarch. Because this one works. Sonya showed us how to make four different holiday cookies: lemon-anise biscotti; sugar cookies; gingersnaps; and maple-pecan balls. And luckily, she had piles of ready-made cookies in the corner. It took all my strength to not eat five of each. They tasted that good. And familiar, in an entirely different fashion. The biscotti crunched, with a sharp crack, then a flood of licorice bite on the tongue. The lemon zest cut through the sweetness, beautifully. 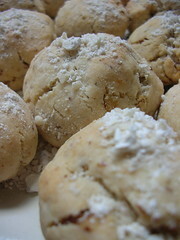 The maple-pecan balls had a wonderful sandy quality, flaky and rich as Mexican wedding cookies. The sugar cookies came close to my imagined ideal of gluten-free sugar cookies, with a satisfying thickness, and the rush of vanilla. (Of course, I still want to play with the recipe, try some butter instead of her suggested margarine, add some nutmeg, see what happens. I’ll let you know.) And the gingersnaps? Crisp and chewy, sharp and sweet, rich and light—eyes-closed goodness. The gingersnaps of my childhood, with thick granules of sugar embedded on the crackly top. I could have cried. There they were. During the class, I stood next to a mathemetician from Boeing, who was so interested in baking that he did an unpaid internship with Tall Grass bakery in Seattle. We discussed the best ways to cream butter. A woman in the front had never baked before, and she asked for help with every step. And everyone chattered, happily. Hands dipped in dough, the front of my sweater speckled with rice flour, I traded stories and felt the familiar actions return to my hands. I was baking, with ease. Cooking, eating, talking, and laughing—-my favorite way to live. It was a joyful chaos, just as the holidays should be. At the lovely cooking class, the head of Salud told us that, in a recent taste test at the store, everyone agreed that the best-tasting molasses was Plantation Barbados unsulphured molasses. Try it for this recipe. Preheat the oven to 350°. Mix the featherlight flour, xanthan gum, and baking soda together in one bowl.Cream the butter and sugar in another bowl. (This works well in a KitchenAid. If you are doing it by hand, be sure the butter is partially soft. Be prepared for bicep work! )Add the eggs, then molasses, then apple cider vinegar to the creamed butter and sugar. Throw the spices into the mix. Slowly, stir in the combined dry ingredients until the mixture is just blended. Roll the dough into small balls (about one inch). Place them on a greased cookie sheet or silpat. Bake the cookies for 10 to 12 minutes, depending on your oven. Watch the first batch carefully, to judge how long you should bake them. You might find it convenient to mix up a large batch, instead of continuously making up flour for that night's recipe. Sonya even suggested storing flour in sealable, five-gallon paint buckets! Shauna, if you don't have it yet, there is a gluten free (and dairy optional) dessert book called Fabulous and Flourless by Mary Wachtel Mauksch that has wonderful recipes for desserts based on nut flours. The recipes call for margarine, but I use butter and everything I've ever made is delicious. There's a wonderful brownie recipe that is better than the one I used to use, and some great chocolate/hazelnut and butter/almond cake recipes. There is a particularly good pecan carrot cake, that while different in texture and height (it's a bit crumbly), has all the nutty/chewy/spicy flavors just right. I've never tried the cookie recipes, but I make birthday and special occasion cakes from this cookbook all the time, and it's been a great purchase. I'm not much of a baker, even before I needed to learn to watch my sugar any my gluten, but the recipes usually call for less than a cup of sugar for the entire result, which is reasonable for a "splurge" on the sugar end of things. (The recipes are awful with non-sugar sweeteners, stick with the sugar.) Hopefully there's a copy at the library you could try-- I bought my copy online from amazon. Good luck, and so glad to hear about your cookie success! all my post-celiac cookie baking efforts, out of appearance, taste and texture, I've managed to get two out of three, so I'm looking to improve my odds. Erika, I'm definitely going to check out that book. Thanks! My fellow Gluten-Free Girl readers, Shauna gave me a little stack of these ginger wonders yesterday, and they are absolutely delicious! Crunchy and chewy, with a good, spicy kick. Shauna, my dear, I love having you and your goodies so close by. How cool that you have a functional flour to bake with! And doesn't everone store their flour in those buckets? They hold 25 pound bags of most things. My mom and I made these last night with a few variations: SWEET rice flour instead of plain ole rice flour (although, to be honest, I'm not sure what is the difference), ground date sugar instead of the white kind (so we can convince ourselves that it's a healthy treat), and plugra butter (Mmmm). We also added a touch extra ginger and molasses (I always do), and added the spices to the dry ingredients so they'd be mixed in well. All in all, a HUGE success. These were the first cookies I might eat even if I COULD have flour. They were that good. Light and airy and a little crumbly, I ate spoonfuls and spoonfuls of dough (And then 5 or 6 finished cookies right from the oven). Everyone MUST try this! I might also recommend 1/4 tsp of black pepper for a little kick next time. My whole family loves the Ginger-Molasses Cookies! Who needs wheat? Thanks so much for your blog. I keep coming back to your recipes in my searches--yours are so reliably great! I have 2 young kids with newly-diagnosed celiac. I'm eating GF, too, bc my son is still nursing. (He also has to avoid 75% of the vegetable/fruit kingdom, so it's a challenge.) My lucky husband, who we've since discovered is also gluten intolerant (kids got it from him, turns out!) had an extremely cushy entry into the GF world--we were already a fully-functioning GF family, so he had your cookies to soften the blow. I have a question for you, though: have you found a good source of bulk (and hopefully cheaper?) GF flours? We've just been shopping at the PCC. Those little bags are so limiting. I'm a Seattle local, too. And, do you know anything about the nutrition of goods made with GF flours, relative to wheat? BTW, I made the Molasses Ginger cookies with Ener-G egg substitute and a soy margarine, and they turned out great! Erika, I'm going to check out that book, too--my kids think they hate nuts. Seems like that book could sneak some nutrition in to an otherwise weak moment. I just tried making these without the vinegar (because I am allergic) and they were really flat. Any suggestions? http://www.oprah.com/recipe/omagazine/recipes/200911-omag-recipe-pumpkin-pie, and it was by far the best GF thing at the thanksgiving table! Being a bit new to GF baking/cooking, it's taking some getting used to with our holiday menus. I'm glad to have found your blog as a serious resource. These are great, as long as you cook them long enough. I am new to gluten free cooking and am realizing it is a process of relearning how different ingredients cook up, such as these cookies. Next time I won't have the oven on convection and put them on a lower rack so that the bottoms are sure to be done. But, even my kids thought these were great and didn't even notice they were gluten free! What I am most excited about is using this as a crust to a cheese cake (if I can find a GF one worthy of making). I will absolutely make these again, well done!